My plush Armour is wonderful, comfy, perfect for cold NY weather. Communications with Chasten were a delight. Follow me on Instagram for a FREE GIVEAWAY coming soon!! If you can't have a stack of pancakes for breakfast...order a stack of cowls!!!! Follow @plusharmour on Instagram for a %15DISCOUNT on a custom order! 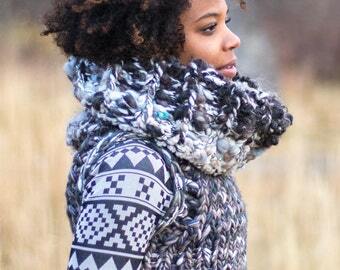 Where hand knit design meets creative expression. Every piece in my shop is not only knit by hand, but has its own unique design. Each piece is a work of art that starts as a seed in my mind and is visualized into conception. Pick your snowflake! Choose one of my own creations or request a custom design just for you. Due to rotating supplies of yarn items cannot be replicated, but they can be inspired by! 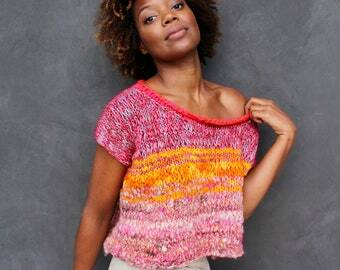 I mostly work with chunky yarns in bold, fun colors mixing them together to create depth and texture. I'd love to work with you to design the piece of your dreams. Upfront payment required for material. The balance is due upon completion of item and approval of photos. If you do not like your item I offer returns with full refunds (-shipping) as long as no damage has been done to the item. If you do not like your item I offer returns with full refunds provided there has been no damage to the piece. USPS First Class International for out of country orders. Additional shipping requests can be accommodated with potential fees. Because Plush Armour creates one of kind pieces, production does run on the slower side. I do not re-create exact replicas. To keep updated for new items please follow me. They will be added in batches. For custom made pieces please message me. I can work with whatever yarns and colors you would like.